CAN Greece leave the euro quietly? Its size would suggest so: the Greek economy is just 2% of the euro area's GDP. But so far the Greek crisis has had plenty of noisy knock-on effects. Economists, who like to borrow medical terms to lend themselves an air of scientific rigour, call this “contagion” (see also: Dutch disease, liquidity injection, etc). Economic troubles in one country can infect others. Can economic epidemiology predict which countries might fall sick following a Greek exit? It has long been known that shocks in large countries or markets send out ripples. In a 1989 paper Robert Shiller of Yale University showed that between 1919 and 1987 American and British stockmarkets had moved in tandem, but that this correlation could not be explained by parallel changes in dividend payments. A few years later Barry Eichengreen and Andrew Rose of the University of California, Berkeley, and Charles Wyplosz of the Geneva Graduate Institute looked at 20 currency crises in industrial economies between 1959 and 1993. They found that a crisis in one country increased the probability of crises in others. That big markets and big countries tend to have a big impact may not come as a surprise. But something more striking started happening in the 1990s. Crises in much smaller countries began infecting the global economy (see left-hand chart). A 1994 crash in Mexico led to unexpectedly large stockmarket slumps across Latin America. Then, in June 1997, Thai markets dropped suddenly, dragging down Indonesia, Hong Kong and even seemingly unrelated economies such as Canada's. This created a contagion puzzle: how do shocks in small countries spread so far? Trade is one reason. When an economy sneezes, its trading partners catch a cold, as demand for their exports falls. The germs can also spread through financial channels, such as foreign direct investment or lending to companies located abroad. Such links transmit losses quickly across borders. Indirect links via common creditors play a role too. In the late 1990s Japanese banks had lent to companies in booming Thailand and Indonesia. When Thailand went bad, those Japanese banks realised that their Thai customers would never repay their loans. To compensate, they cut credit to Indonesia and other economies. All this makes intuitive sense. But even when economists added up the effects of trade and financial links, the spillovers from crises still seemed too large. Ripples from the Mexican and Asian shocks spread further than expected. The contagion puzzle was still unsolved. Kristin Forbes and Roberto Rigobon, both of the Sloan School of Management at the Massachusetts Institute of Technology, were among the first to give an explanation. They showed that in good times spillovers between countries don't matter much—so markets can appear not to be related. But during a crisis, when volatility rises, pre-existing links between economies suddenly have huge effects. This finding was striking: a dormant interdependence of economies was spreading disease like a shipful of flea-covered rats. This suggests that economies are far more linked in bad times than their ties in good times suggest. Other research revealed another new culprit: “pure” contagion. It occurs when a crisis spreads above and beyond what can be explained by links between economies. This seems an important factor in the euro crisis, according to a recent paper by Vítor Constâncio, a vice-president at the European Central Bank (ECB). He examines what investors have to pay to insure themselves against the risk that a euro-area country will default on its debts (credit-default swap spreads, or CDSs). The cost of this insurance has been rising for many euro countries since 2009, with Greece leading the way (see right-hand chart). Mr Constâncio crunched CDS data to estimate market perceptions of the probability of another country defaulting if Greece defaults. Markets now put a much higher probability—sometimes up to 45 percentage points more—on Ireland and Portugal also defaulting if Greece fails. 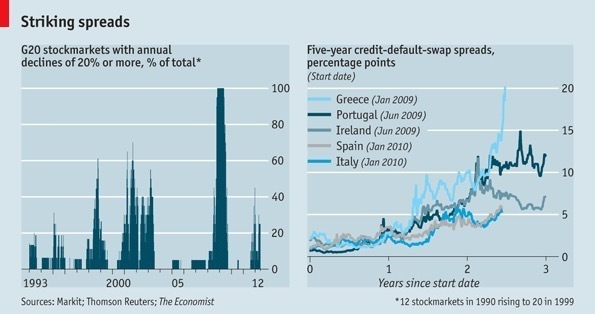 The CDS spreads thus not only document contagion across Europe, but show that the risk of further contagion has grown. To complement the picture, Mr Constâncio also looked at countries' sovereign bond yields. This analysis suggests that around a third of the variability in Spanish and Italian bond yields was due to contagion from Greece, Portugal and Ireland rather than domestic factors. Finally, he examined the spread between euro-area governments' borrowing costs and German government debt, which is considered a safe investment. Even after controlling for a wide set of factors—including risk aversion, domestic sovereign risk and credit ratings—he finds that Greek downgrades drive up other countries' bond spreads. Some contagion may be caused by markets waking up to the possibility that the euro zone could indeed fall apart. But contagion doesn't spread evenly: risks are high for Ireland, Spain and Portugal, but much lower for France. Country-specific factors, as well as euro-wide concerns, seem to play a role. Worryingly, Italy, which some believe will be next in line for a bail-out, could go either way. Pessimists argue that it is more vulnerable than its trade and financial links with Greece suggest. There is a final lesson: expect the unexpected. The path for pure contagion is devilishly hard to predict. In 2004 Stefan Straetmans of Maastricht University, in co-operation with Philipp Hartmann of the ECB and Casper de Vries of Erasmus University Rotterdam, examined weekly slumps of at least 20% in different financial markets to measure links between these markets, both within a country and between countries. American stock and bond markets were highly correlated, but had a low risk of contagion. In Japan contagion risks were twice as high, despite its markets' relative lack of synchronicity. So market correlation data cannot predict contagion. It is like an airborne virus that can change direction with the wind, and infect countries that least expect it.